Attorney-Written Legal Exams: Legal Procedures, Constitutional Law, Case Law and Criminal Statutes. Our Mission: YOU finishing at the TOP of your agency's promotion list! Attorney Written Police Legal Exams are Now Available in our Advanced Police Promotion Testing Course! Visit our Advanced Police Promotion Testing Course for more details. You can take the Advanced Desktop and Advanced Online legal exams from the leading national law enforcement legal sourcebooks. And, take the exam from the police legal guidelines text used in your state! Take an exam from the newest editions of The Law Officer's Pocket Manual, Briefs of Leading Cases in Law Enforcement, Civil Liability in Criminal Justice and Legal Guide for Police - Constitutional Issues. Our current list of state law enforcement exams and flash card sets from the major state law enforcement source books includes Arizona - Law Officers Legal Source Book - the Police Bible, California - Peace Officers Legal Sourcebook & California Codes, Connecticut - Law Enforcement Officers' Field Manual - The Red Book, Florida - Law Enforcement Handbook, Illinois - Officers Legal Source Book - the Police Bible, Michigan - Criminal Law and Procedure - a Handbook for Michigan Police Officers, Ohio - Criminal and Traffic Field Guide, Pennsylvania - Crimes Code of Pennsylvania AND Legal Guidelines - Criminal Law Digest of Pennsylvania, Texas - Texas Criminal and Traffic Law Manual, and Washington D.C. - Washington D.C. Criminal Law and Procedure. More states are being added. Suggest your state! 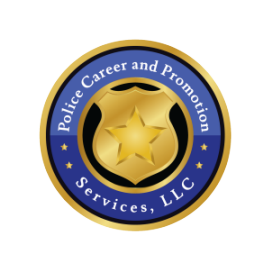 We are Police Career and Promotion Services, LLC, a police promotional testing company, and we write promotional textbook and legal exams for police agencies throughout the U.S., using the best law enforcement textbooks in use today. You can take legal exams from each of the national and state titles on this page over and over to improve your score. You review the complete exam, your answers, your score, the correct answers and the page number from the book where the material appears. Study your textbooks and take each exam over and over until you can ace it! This is proven to be a great way to study! We are so sure of our mission of helping you get the promotion that we offer you our exclusive 100% "Better than Risk Free" Satisfaction Guarantee! Free PDF Report Want to ACE Your Police Promotion Exams? Follow these 10 Steps to Written Exam Mastery!! Want to try it out before you enroll? No problem! Sign up for our newsletter and you will receive an immediate email to take a real 50-question police promotional exam and a Legal Exam, as well as a 20-question sample Advanced Online exam! Take these exams in the next few minutes! Which national and state legal exams are included? Law Officer's Pocket Manual - 2019 and 2018 Editions - from BNA Books - 310+ questions. Briefs of Leading Cases in Law Enforcement - 9th Edition 2015 and also 8th Edition exam is available. Taylor & Francis - 200+ questions. Civil Liability in Criminal Justice - 7th Edition 2018 - Routledge - 200+ questions. 6th Edition exam is also available. Legal Guide for Police - Constitutional Issues - 10th Edition 2015 Taylor & Francis - 9th Edition also avaiable. 150+ questions. Arizona - Law Officers Legal Source Book - 2015 - the Peace Officer's Bible - 300+ questions. California - Peace Officers Legal Sourcebook & California Codes - written by the California Attorney General and as featured by CopWare. Updated twice per year, latest update March 2019. 300+ questions. Connecticut - Law Enforcement Officers' Field Manual - "The Red Book" - 2018 as featured by LooseLeaf Law Publications - 260+ questions. Florida - Law Enforcement Handbook -2019 edition - as created for Florida Law Enforcement Officers state-wide by the Miami-Dade Police Department and available through Blue360 Media. Illinois - Officers Legal Source Book - 2015 - the Police Officer's Bible - 460+ questions. Michigan - Criminal Law and Procedure - a Handbook for Michigan Police Officers - Third Edition - Kendall Hunt Publishing Company. 240+ questions. Ohio - Criminal and Traffic Field Guide - Blue Media 360. 110+ questions. Pennsylvania Legal Exams - Criminal Law Digest of Pennsylvania - Legal Guidelines - Crimes Code of Pennsylvania 2018 and 2017 Edition - from LexisNexis. 380+ questions. Texas - Texas Criminal and Traffic Law Manual 2017-2018 and 2015-2016 editions - written for Law Enforcement Officers throughout the great State of Texas and available through Blue360 Media. 320+ questions. Washington D.C. Criminal Law and Procedure 2018 - written for Law Enforcement Officers serving our nation's Capital city, and available through LexisNexis. 360+ questions. More states are being added. Suggest your state! ADDED BONUS - You will download your copy of An Attorney's Guide to Studying Police Legal Guidelines. This 10-step special report from an attorney is written specifically to help you as a police officer understand how attorneys study and prepare for legal exams, and how to apply these techniques to your studying for promotion! Includes the special methods attorneys use to study for their high-pressure Bar Exams. This PDF Report is FREE when you enroll! Who writes these Police Legal Exams? These police legal exams are written by and constantly updated by an attorney and validated by the staff of our police promotional testing company, PolicePromotion.com. Mastering these legal concepts will also help you score high in assessment centers and be useful on the street every day of your police career. Since 1985 thousands of police officers around the nation have been promoted using our exams and assessments to prepare. Read what just a few of them have to say. "I joined your website in December. Putting myself on a strict schedule and taking over fifty tests on the site, I was preparing for the Lieutenant Promotional Exam with my agency. "I just wanted to thank you for this site! It really made me focus 110% on the testing process. I would not have known how much needed to go into preparation if it were not for you! We are so sure that our testing products and services will help you achieve your career goals that we are the ONLY police testing company that offers you our 100% "BETTER THAN RISK FREE" SATISFACTION GUARANTEE! Connecticut Law Enforcement Officers' Field Manual - "The Red Book" - 2018 Edition as featured by LooseLeaf Law Publications - The most widely used legal reference book for Connecticut law enforcement officers covering all aspects of Connecticut criminal law and legal procedure. 260+ total questions from this title are available. Questions cover all topics in the book; Offenses, Stop & Frisk, Identification Procedures, Interrogations, Search & Seizure, Juvenile Matters, and Family Violence Investigations. Illinois Officers Legal Source Book - the Police Officer's Bible - 2015 - from Law Enforcement Training, LLC. - 460+ total questions in the exam. Includes the Source Book-Volume I (Peace Officer's Bible), including 4th and 5th Amendment and practical issues. New this year is Volume II which includes Civil Liability / Section 1983 issues. Ohio Criminal and Traffic Field Guide - 2017-2 - from Blue360 Media - 110+ total questions in the exam. Ohio’s most-often used criminal and traffic laws are broken down into their material elements for easy application and reference. Pennsylvania Legal Exams - Legal Guidelines - Criminal Law Digest and Crimes Code of Pennsylvania 2018 and 2017 Editions - from LexisNexis. Each yearly edition from these two books are combined into one comprehensive and difficult Attorney-written exam with 380+ questions. Texas Criminal and Traffic Law Manual 2017-2018 - written for Law Enforcement Officers throughout the great State of Texas and available through Blue360 Media. Exam for the 2015-2016 Edition also available. There are 320+ total questions covering the Texas State Penal Code, Code of Criminal Procedure, Family Code, Health and Safety Code, and the Transportation Code. Briefs of Leading Cases in Law Enforcement 9th Edition 2015 - Taylor & Francis. 200+ total questions from this title. Here is the case law sourcebook used on police promotional exams all over the nation. Cases covered include all aspects of probable cause, the exclusionary rule, stop and frisk, arrests and seizures of persons and things, searches, vehicle stops and roadblocks. Publishers. 200+ total questions from this title. The exam for the 6th Edition is also available. This handbook addresses the problems confronting criminal justice practitioners and their agencies due to the ever-increasing number of civil liability lawsuits. It introduces the reader to civil liability generally and the federal law specifically, while indicating steps that can be taken to minimize the risk of litigation. Legal Guide for Police: Constitutional Issues 10th Edition 2015 - from Taylor & Francis. 150+ total questions from this title. Here is an in-depth and analytical U.S. Constitutional guide used on police promotional exams all over the nation. This comprehensive book covers developments in the law of arrest, search and seizure, police authority to detain, questioning suspects and pretrial identification procedures, police power and its limitations, and civil liability of police officers and agencies. Law Officer's Pocket Manual 2019 and 2018 Editions - from BNA Books - 310+ questions. Here is one of the best and most often used national legal sourcebooks for police promotional exams all over the nation. This legal handbook uses clear definitions and scenarios to cover all aspects of case law and constitutional law. This material is what a police officer and supervisor need in order to do their jobs correctly on the streets. Arizona Officers Legal Source Book - the Peace Officer's Bible - 2015 - from Law Enforcement Training, LLC. - 300+ total questions. 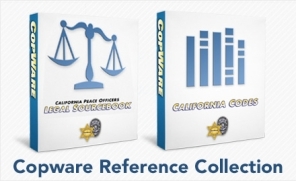 California Peace Officers Legal Sourcebook & California Codes -written by the California Attorney General and as featured by CopWare. Updated twice per year, latest update March 2019. 300+ total questions from this material are featured. Our questions cover material from the California Peace Officers Legal Sourcebook, Penal Codes, Vehicle Code, Health and Safety Code, Family Code and the Welfare and Institutional Code. Florida Law Enforcement Handbook - 2019 edition - as created for Florida Law Enforcement Officers state-wide by the Miami-Dade Police Department and available through Blue360 Media. 310+ total questions are in the exam, covering Florida Legal Guidelines, State Procedural Law, State Substantive Laws and Civil Forfeiture Guidelines. Michigan Criminal Law and Procedure - a Handbook for Michigan Police Officers -4th Edition. Published by Kendall Hunt Publishing Company. 390+ total questions covering all aspects of Michigan Criminal Law and Procedure which are featured. This comprehensive textbook was created for all Michigan police and law enforcement Officers state-wide by the Michigan State Police, and published by Kendall Hunt Publishing Company. Other great police and law enforcement textbooks are also available from this publisher! Washington DC Criminal Law and Procedure 2018 - Comprehensive 360+ question attorney-written exam for the District of Columbia Criminal Code and Procedure December 2018 edition. From LexisNexis.